Kingkiller Chronicles reviewed by Heather Magaw. See below for special giveaway. 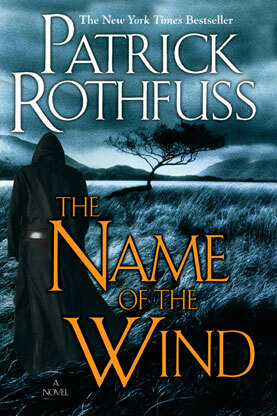 You may have heard of Patrick Rothfuss’s novels, The Name of the Wind and The Wise Man’s Fear. You may have read other reviews of the books, or at least the synopsis from amazon.com. Both books sound really interesting, but, if you’re like me, you are also completely daunted by the enormous number of fantasy titles out there. They all sound interesting, but the promise of the jacket copy is no indication of the quality within (it’s a crapshoot). Like me, you have thoroughly examined the fantastic hero’s journey, and you’re poor. So, you talk to your friends, at exhaustive length, about what they’re reading, and you buy the books they recommend. Well, my friend, here is your recommendation: you must read The Name of the Wind and The Wise Man’s Fear. If you haven’t heard of Rothfuss’s novels, The Name of the Wind begins in a small inn in a tiny town on the outskirts of the empire. The owner of the inn, Kote, seems to be an ordinary man; the townspeople are ordinary people, the village is an ordinary village. The story escalates from there: outliers of the empire’s distant war start showing up in town, and it turns out that Kote is actually Kvothe, legendary musician/storyteller/arcanist/swordsman and, lately, villain with a price on his head. He has retreated to this village to escape his past and the charges against him. Of course, no one can hide from his past, and Kvothe’s soon catches up to him, in the form of Chronicler, an equally renowned storyteller, who has tracked Kvothe to his remote village in order to obtain a first-hand account of his life. 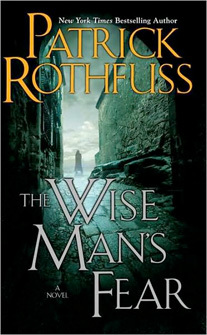 Thus begins three days (The Name of the Wind and The Wise Man’s Fear each cover one day, with the third yet to be published) during which Kvothe tells his version of his legendary life, interspersed with “reality breaks” for things like sleep, meals, the conducting of business (both novels actually take place in a tavern, after all) and dealing with the aforementioned outliers. The books are a fantastic, straight-up adventure story, with magic, a number of supernatural bad guys, a resourceful, engaging hero and an interesting mix of secondary characters, in a setting that enhances the story with its solidness. The stories also function as restrained meta-fiction: finely-crafted novels about a master storyteller giving his life’s story to an equally illustrious colleague. Rothfuss engages both the intellect and the gut; you can cheer for Kvothe and laugh or cry at his exploits, and at the same time question his, and everyone else’s, motives, the nature of truth, and how much of a person’s circumstances is of their own making. The biggest thing, though, that distinguishes The Name of the Wind and The Wise Man’s Fear from other post-modern or fantasy or post-modern-fantasy novels is its finely-crafted restraint. Rothfuss shows amazing self-control in his worldbuilding, avoiding the panoramic descriptiveness that pushes the settings of so many fantasy novels to the forefront, overshadowing the plot and characters. The magic and other fantastic aspects are treated as natural parts of an ordinary world- the characters are no more amazed by them than we are amazed by the internal combustion engine or the internet. Though there are remarkable events scattered throughout the stories, their rarity makes them all the more remarkable. The characters are complex and fully developed, but by no means transparent; their motives are hidden or questionable, they are by turns magnanimous and self-involved, and endearingly fallible. I was particularly pleased with the female characters, who are as capable and fully realized as the men, a rare treat in a fantasy novel. In fact, all the characters could easily function in any modern novel; they would not seem out of place in a Starbucks or on a newspaper staff, though they seem too honorable for a Beltway thriller or a legal procedural. So again, I truly recommend that you read The Name of the Wind and The Wise Man’s Fear. I guarantee that you will be riveted by the swashbuckling adventure and realistic, lovable characters. You will get hooked by the intimate storyline that does not require reference material to keep track of. A warning before you begin, though: make sure you have a block of free time ahead of you, and are adequately provisioned. Send your children to their grandparents, free your significant other to do as they like. Once you begin reading, you won’t be able to stop until the end. Patrick Rothfuss has generously contributed signed hardbacks of the first two novels in his Kingkiller Chronicles. All you have to do for your chance to win the signed copies of The Name of the Wind and The Wise Man’s Fear is to post a note in the comments below by midnight on August 4th. One entry per person. The contest is open to anyone with a U.S. or Canadian mailing address. The winner will be chosen at random and contacted via email for shipping instructions. If you are under 14, please get your parent’s permission to enter this contest. Special thanks to Heather Magaw who wrote this review for the first two novels in the Kingkiller Chronicles. When the opportunity arose to do this review and to host this special giveaway for Patrick Rothfuss, I asked the person whose verbal review of these books convinced me to read them, and that person is Heather. Congratulation to Meghan S., the lucky winner of the signed hardback copies of The Name of the Wind and The Wise Man’s Fear by Patrick Rothfuss. Stay tuned for more exciting giveaways. We have two signed copies of Ghost Story by Jim Butcher that will be making their debut in the next week or so. This entry was posted in Books and Literature, Contest, Fantasy, Fiction, Reviews, Uncategorized and tagged Contest, Kingkiller Chonicles, Name of the Wind, Patrick Rothfuss, Review, Wise Man's Fear. Bookmark the permalink. 18 Responses to Review: The Kingkiller Chronicles by Patrick Rothfuss – Enter to Win Signed Books! Hi John-Paul, they really are terrific books. 🙂 Good luck!!! Oooh! I loved these. I bought an e-book copy of Name of the Wind and read the other at the library, though, so I would love to get lovely hardback signed ones! I did also boost the signal on facebook =D…. If I win, I *swear* to read them. I haven’t had a chance to read Pat yet, but friends have and I’d love to start. I ‘boosted the signal’ on my facebook page! Wowwww! What a fantastic giveaway!! I love Mr. Rothfuss and have diligently read all of his books (even The Adventures of the Princess and Mr. Whiffle)! A signed copy of any of his books would make me have a mini-faint session! I would love to read these books. Thanks for the great giveaway!! Not only are these books beyond AMAZING, but Patrick himself is a hilarious guy whose honesty about the craft of writing and the realities of the publishing world were one of the best things I saw at last year’s RT conference. I’m definitely a life-long fan!!!!! His books are absolutely amazing! I loved The Name of the Wind but actually enjoyed The Wise Man’s Fear a little more despite what everyone says! Oh and I boosted the signal on my facebook! What a great giveaway – I was just eyeing these at the bookstore the other day, since so many people I know have raved about them. I’d love to win signed copies, so thanks for the opportunity! I boosted the signal on Twitter too. I’d love to get a copy of those! Awesome review and giveaway. Absolutely fantastic book. I’m on my third read through already! I’m nerding out and even posting on his facebook discussion board with theories! The “best” book I have ever read. And I read a lot! Very re-readable as well. I cannot wait for the 3rd installment. Cannot say enough about it. The BEST book I have ever read. Thank you to everyone who entered. The contest is now closed, but please feel free to leave comments about the review or about Patrick’s work. He’s a fantastic writer!